Goldfield, Nev.—J. 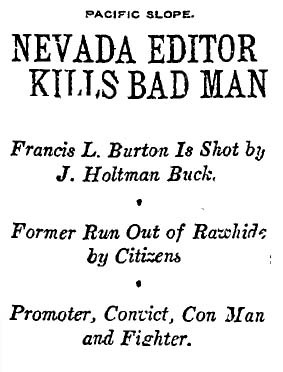 Holtman Buck, editor of the Western Nevada Miner in Mina, Nev., shot Francis L. Burton to death during a fight over a scathing editorial in which Buck said Burton should be run out of town. Burton had a long record of fraud and was paroled from a Montana penitentiary after he conned the warden out of $7,000 in one of his investment schemes. In another case, Burton disguised himself and robbed his own bank, and he barely escaped being lynched after bankrupting an entire mining camp in a fraudulent scheme. More recently, Burton had been in Mina, “jumping town lots and raising trouble generally. He was mixed up in … quarrels and in court continually,” The Times says. A mass meeting was held as soon as he went to Rawhide, and the miners ran him out of town. Apparently (link rot ahoy — lrh) all charges against Buck were dropped. The Western Nevada Miner stands by its story. This entry was posted in 1907, Crime and Courts and tagged 1907, crime and courts, Newspapers. Bookmark the permalink.